The adventure started with the plane ride over. I won’t go into too much detail, but, I had a crazy woman sitting behind me who got mad at me for putting my seat back and literally slammed on the back of it when I refused to lift it up (because I am allowed to put it back…that is why it goes back…). The psycho lady told me if I wanted to put my seat back, I should have bought a first class ticket. (Ummm….nooo….Actually, if you wanted all the luxuries of home YOU should have bought a first class ticket…or just stayed home entirely…) At this point, we got the flight attendant involved, which led to a 10 minutes battle between psycho lady and flight attendant where she tried to reason with her. In the end, of course, the flight attendant had me put my seat all the way back and said to leave it like that because I’m allowed to. The psycho lady was not pleased of course, but, as the flight attendant said, she is on a plane and it is not going to be luxurious and comfortable. The psycho lady was loud and annoying the whole trip, of course, because she was mad that she lost, and because she was a psycho. The rest of the flight was uneventful, until we arrived in Paris. 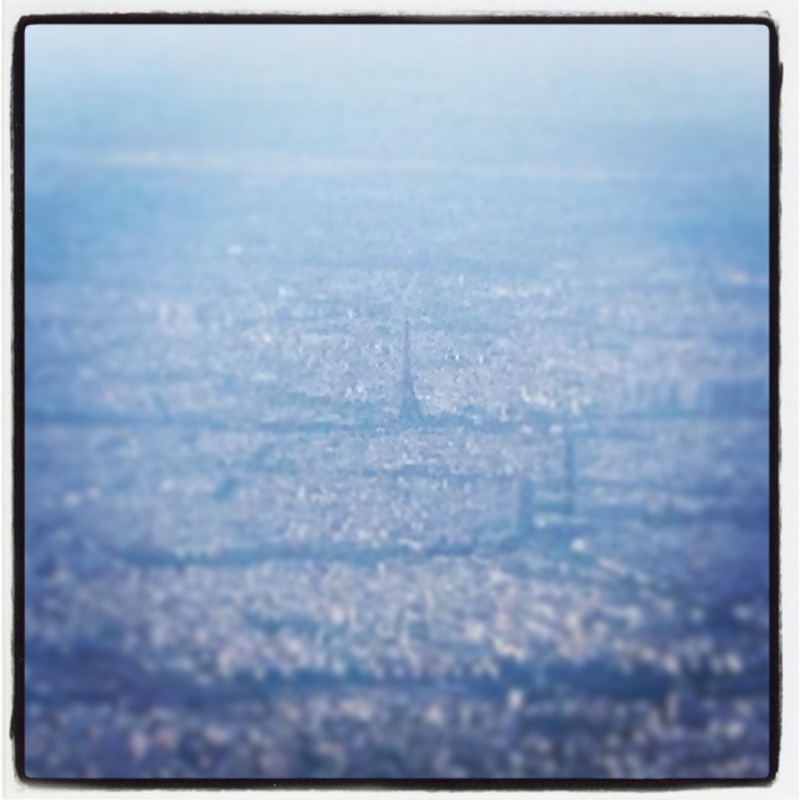 The coolest part was seeing the Eiffel Tower from the plane, which I tried to capture with my iPhone. 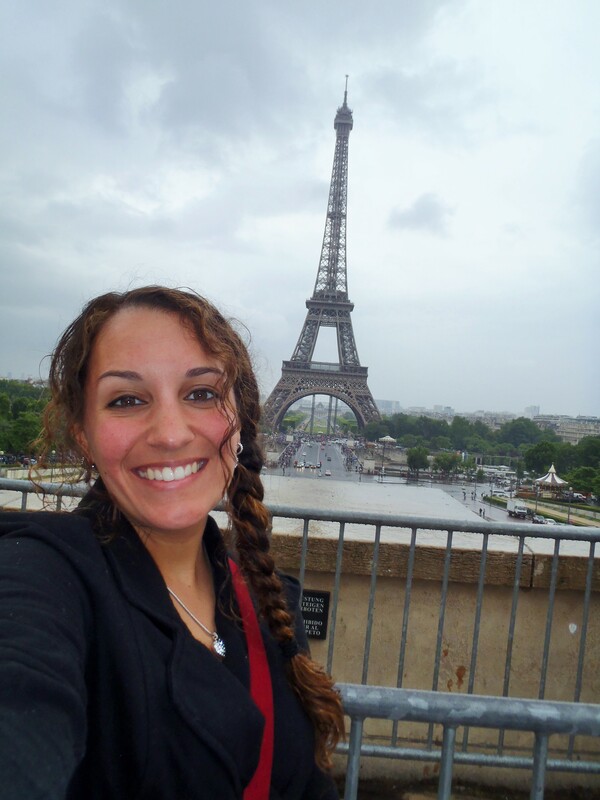 When we arrived in Paris, we had a layover before our next flight, but, because we had to go through customs and because my flights weren’t linked and I had to retrieve my luggage and check in and go through security again, we really didn’t have much time, in the end. My flights weren’t linked because the flight from Paris to Bordeaux was a last minute add-on and I didn’t even think about the fact that they may not link automatically. 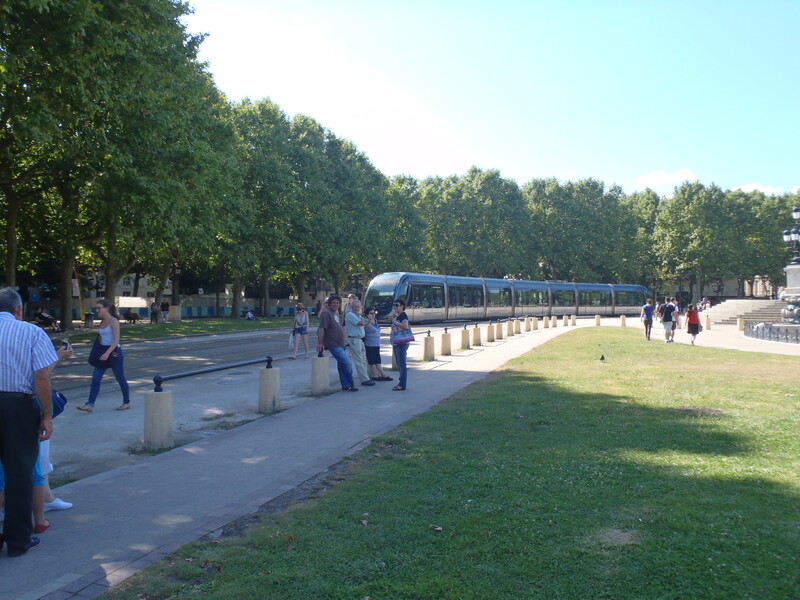 We were originally supposed to take the train from Paris to Bordeaux, but a train strike led us to book a flight so we didn’t have to risk it. The flight from Paris to Bordeaux was uneventful and I slept from pretty much take-off to landing. Finding a dinner spot was challenging and overwhelming and we weren’t quite sure where to begin. We didn’t find the main restaurant street this night and we were trying to eat a little earlier than the French, so most places were empty. It’s much easier to chose a place when there are lots of people inside. We walked around for a while and I finally decided on this restaurant called Le Bistrot des Quinconces. (Don’t ask me to pronounce Quinconces). It ended up being a fantastic choice. The menu was entirely in French and I didn’t know what a single item was. The waiter brought them over to us and told us he would let us struggle for a few minutes and then he’d come explain. When he came back, he explained every item on the menu in detail. It was awesome. I ended up getting fish (cod, I think) on a bed of mashed potatoes and covered in a lemon buttery sauce. It was pure butter and delicious. Oh my goodness. It was heaven. My mouth is watering thinking about it even now. That is one of those times when you don’t dare ask how many calories are in something. It doesn’t matter. Was it worth it? Yes, yes it was. I ordered wine, of course, and for dessert I got a chocolate molten cake that oozes out when you cut it open. Like I said, it was a great choice. After dinner, it was pretty late, and we’d had a long day, so we decided to turn in for the night. After all, we did have to go to work in the morning (the nerve of them!). The train we took around Bordeaux. I won’t bore you with the work details of my day, but I will give you a synopsis of the interesting parts: Firstly, Saft’s headquarters in Bordeaux is GINORMOUS! No one warned me of this. In Cockeysville, we have one (well, as of July, 2) measely buildings. Bordeaux has, like, 15! It’s an entire campus! Anyway, I explored a little, met lots of people, and yada yada yada. Now for lunch: Bordeuax has a legit cafeteria subsidized by the company so it’s really cheap and most employees don’t bring their lunch. 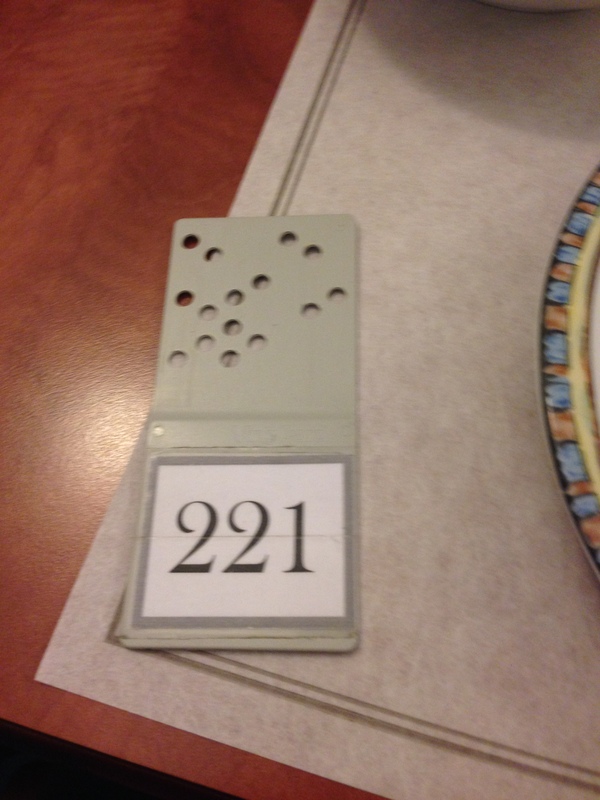 Now – I’m not gonna lie – people had talked this cafeteria up pretty intensely, and it was a bit of a let down. They did have several food choices, desserts, salads, and, of course, wine (yes, wine with lunch is encouraged in France!). On the whole, though, it was nothing special. I guess, though, the price is pretty special (2 to 3 euros for lunch!). Also, the French always get their little cup of coffee after lunch to get them through the afternoon (now this after-lunch kind was like espresso!). In Bordeaux, they have this cute little bar/café area where you can get your coffee and sit a relax afterwards. 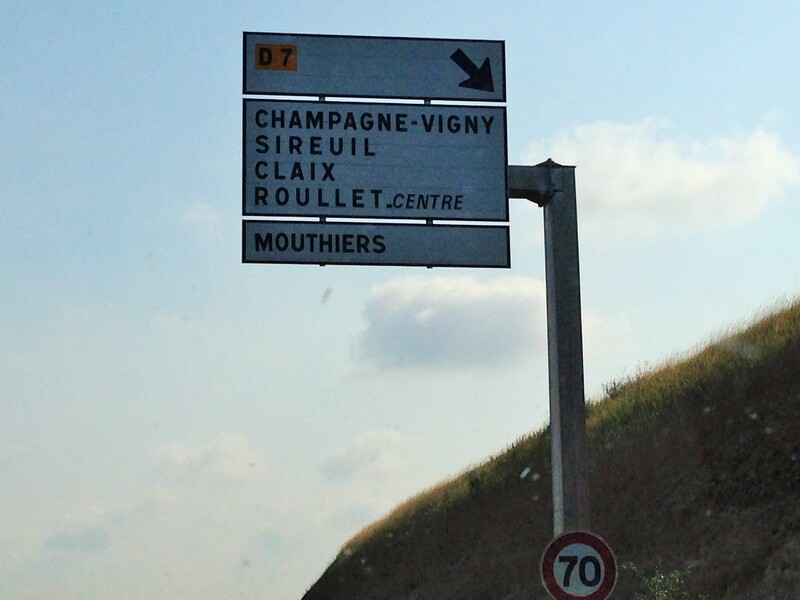 The French are so much more relaxed than us Americans! They were great and Bordeuax was wonderful. After dinner, we walked around for a little before parting ways and heading in for the night. Philippe had just flown in from China earlier that day and I have no idea how he made it through that night! He was a trooper though (I would have been a zombie!) and they both showed us a great evening. Outside La Remise. Yay to making new friends in France! I spent the next day in the Bordeaux plant as well, with nothing remarkable to report about the day, other than that the test lab is a sauna and I don’t know how people work in there because I immediately started sweating upon entering. Plus, it smells. Like, real bad. I went with a Nutella macaron and a Casis Violet macaron. I knew what the Nutella would be like, but picked the other solely based on its awesome purple color and cool name…They were both fabulous! The Nutella was perfect and exactly what I expected and the violet one was fruity and yummy! For dinner, we strayed from the typical French cuisine, and got Italian and Le Parlement D’Italie on Rue de Parlemente. No complaints here. I got spaghetti Bolognese, which is delicious in any language. More wine with dinner and another chocolate dessert ended the night quite splendidly. 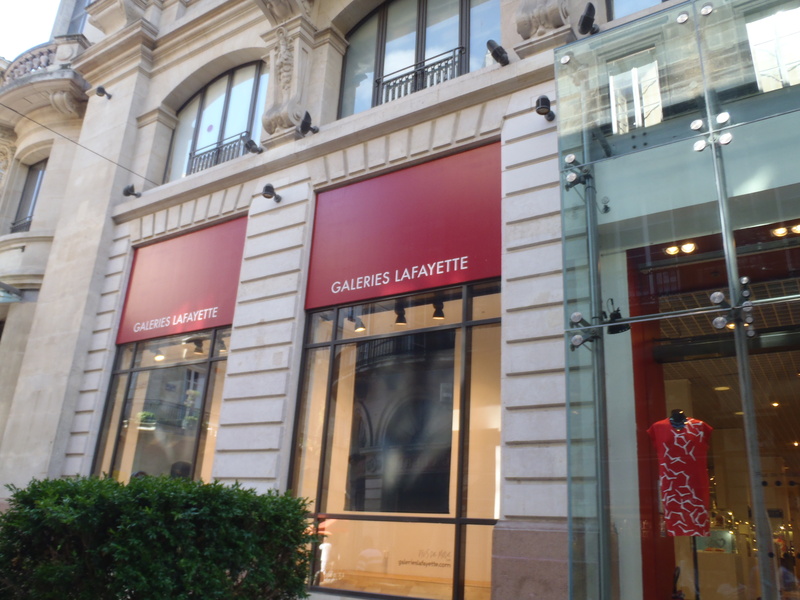 This shopping center on Ste Catherine shares the name of my alma mater, Lafayette! (He was French, after all.) 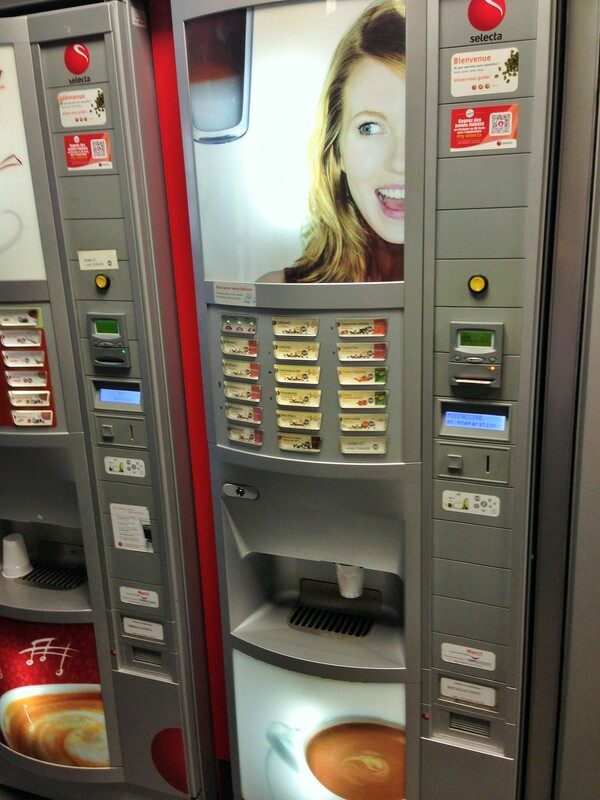 They also had these in Paris. The next morning, Jim and I parted ways for a day. He went off to the Saft plant in Poitiers, and I was headed to Saft’s plant in Nersac, near Angouleme. To that end, after my last breakfast at this hotel, I took a cab to Saft Bordeaux, where I met up with a coworker (my boss’s French counterpart) to make the 45 minute trek to the Nersac plant. The drive was pretty uneventful. It looked like any other countryside in America. The only difference really, was the signage. Once at the plant, I had another day of super exciting work stuff that I won’t go into. (I actually did learn a lot though! I could tell you about it, but then I’d have to kill you…) There was also a cafeteria at this plant for lunch, but instead of a full café/bar for coffee afterwards, they had coffee machines, which were quite adorable and spat out everything from espresso to mocha to hot chocolate to tomato soup (for real!)! The highlight of this day was that everyone was frantically trying to find somewhere for me to watch the Germany vs. USA match that aired at 6pm that night. The Ghana vs. Portugal game was at the same time, and, with France being so close to Portugal, all the bars were airing that game. 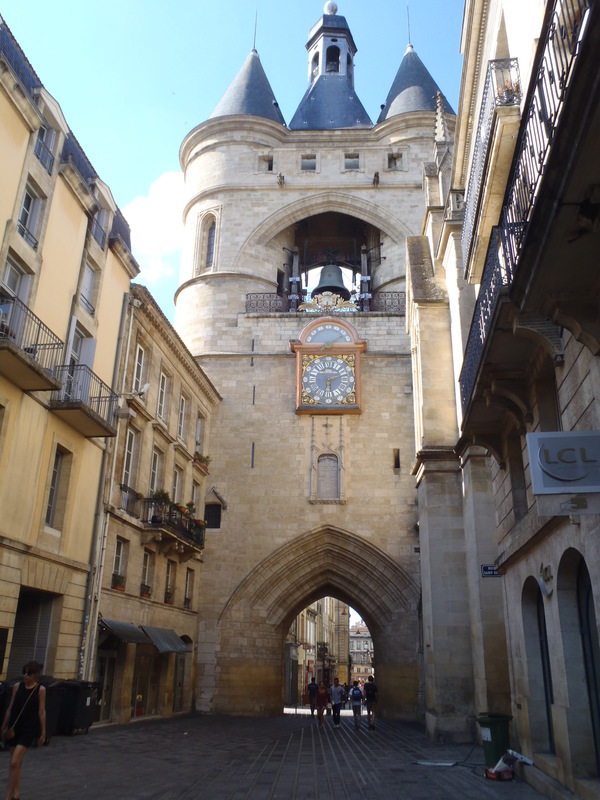 (On top of this, Angouleme is a very small town on top of a very large hill, so there are not too many options.) Moreover, my hotel did not have the channel (Bein) that was airing the game, so I couldn’t even watch it in my room! We came up with a solution though! I ended up going to my coworker, Mikael’s house to watch the game with his family. As we were heading out to make it to his house for the game, everyone wished me good luck (you would think I was the one playing!). It was really fun. He has two little children who speak fluent English because they lived in the US for several years (he worked at Saft in Jacksonville for a while). They brought out snacks and we watched the game and I was in a desperate state. While we didn’t win, we made it through, and I got many congratulations the next day at work! Moreover, he lives in a quaint little town outside of Angouleme with only 1,000 people. It was so picturesque French countryside and was just really cool to see. After the game, Mikael and his daughter drove me to my hotel, the Mercure, where I spent the rest of the night. 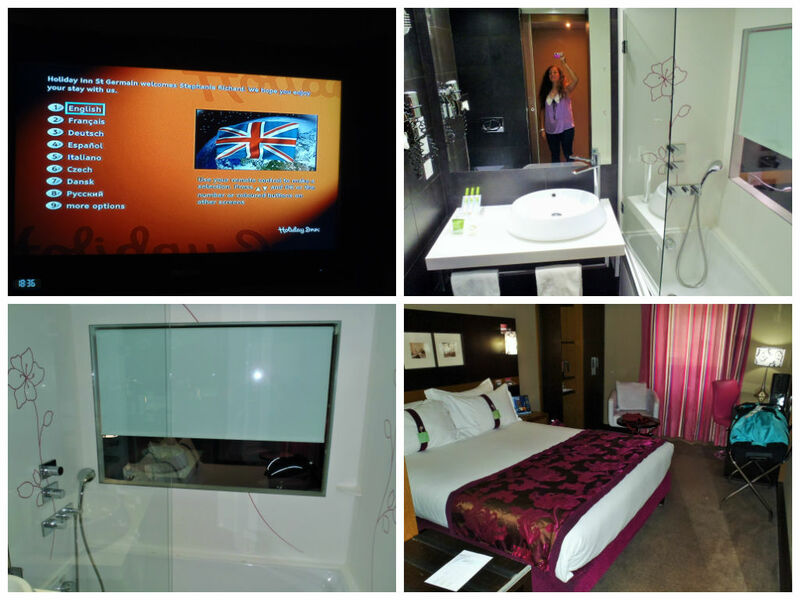 The hotel was very modern and chic, so I took lots of pictures to share. It was awesome. And my bathroom had a wall that became transparent when you flipped a switch so you could see the bed. Why anyone would need this ever is beyond me (maybe to watch TV while showering? ), but it was awesome. I even took a video. Overall, my hotel was super chic and modern and cool. The next morning I had another delicious breakfast in this hotel before checking out. Pretty similar to the first hotel, with an assortment of breads and pastries, yogurt, fruit, cereal, and some hot options. Again, I stuck to the same thing of mainly fruit yogurt and granola. 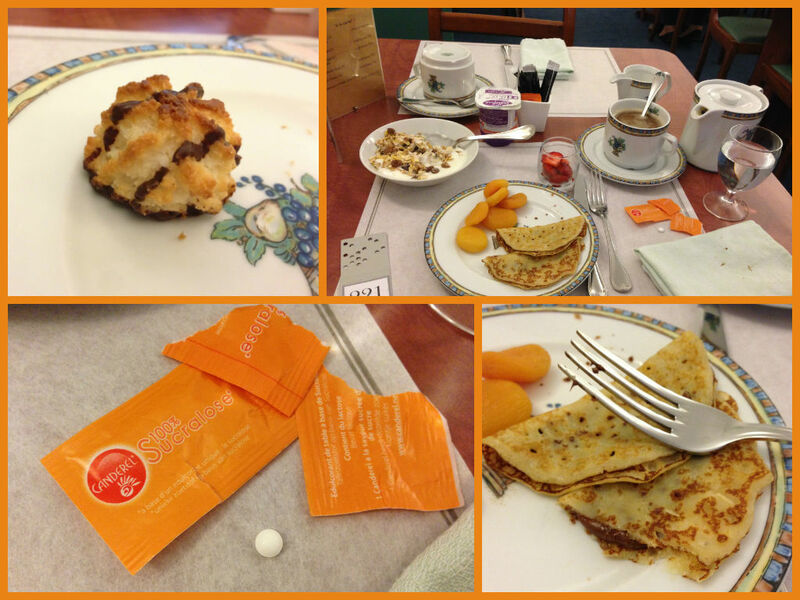 After all, I knew I’d be consuming enough calories the rest of the day to warrant a lighter breakfast. After a few final pictures, a different coworker (Jean-Jacque) picked me up and took me to the plant. Super modern finishes all over the hotel. Anyway, we got a cab to the train station at around 2pm. The train ride was pretty uneventful, but surprisingly full. I guess I just wasn’t expecting there to be so many people on the train. I did see some nice French countryside though, and I got to see windmills (the modern ones, like the cake I made earlier this year for my sister’s coworker). Anyway, we arrived in Paris without issue and made our way to our hotel. 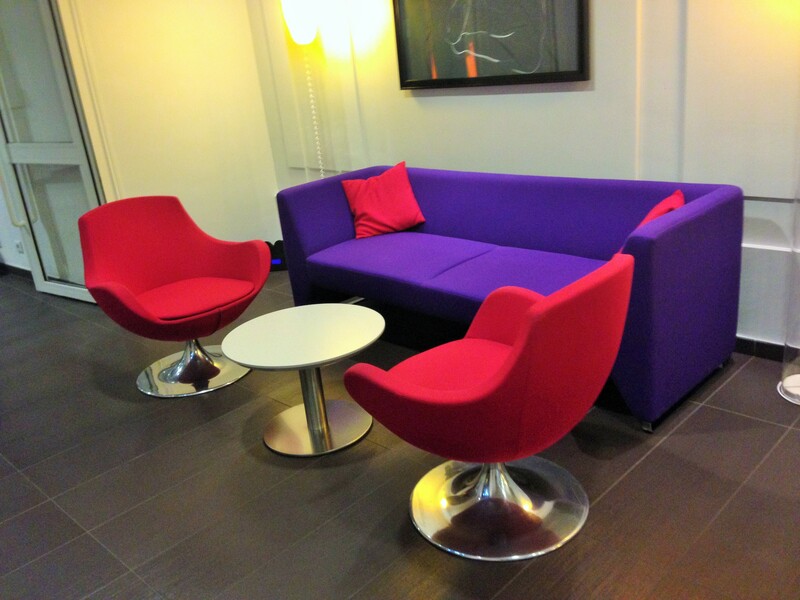 We were staying in the Hotel Holiday Inn Saint Germain des Pres. 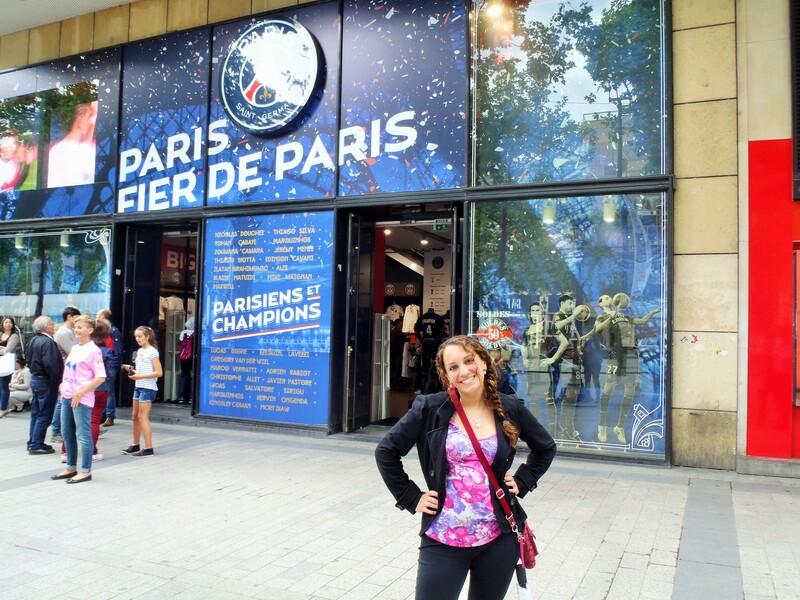 If you know Paris, we were by the Notre-Dame-des-Champs metro stop. We checked into our hotel and this is where Jim and I parted ways for what would turn out to be almost the whole rest of the weekend until our flight on Sunday. So, I spent the next hour or so relaxing, taking pictures of the hotel room (hey, I take a lot of pictures), and setting up a preliminary itinerary for our day in Paris while I waited for Amy to arrive. This hotel was also very chic and modern and I really enjoyed it. Personal message for me on the TV screen, haha. Also, what is it with the French needing a window from the bedroom into the bathroom?? Amy told me this isn’t a new thing, but I’d never seen a hotel that told you the level of stiffness of the pillows and then listed the alternatives. Sweet! 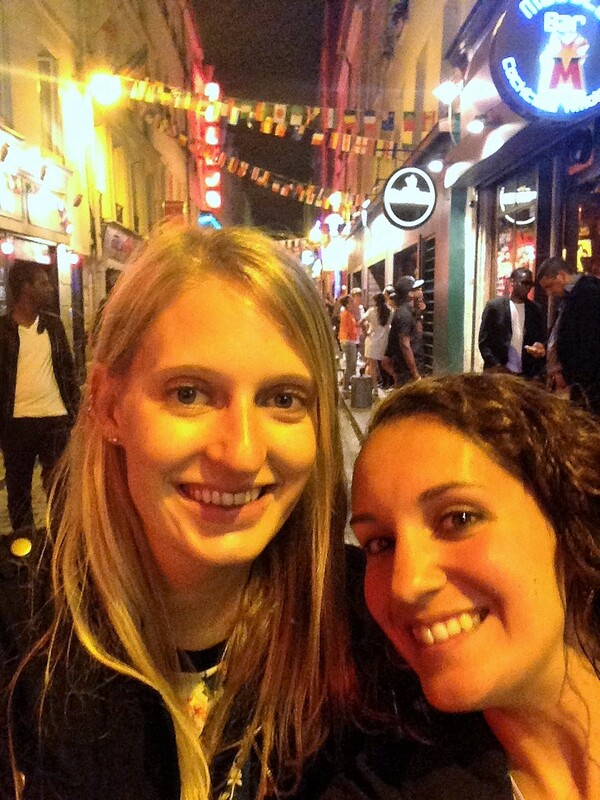 Once we finished jumping up and down and hugging and giggling and calmed down a bit, we changed and headed out for a night on the town in Paris! 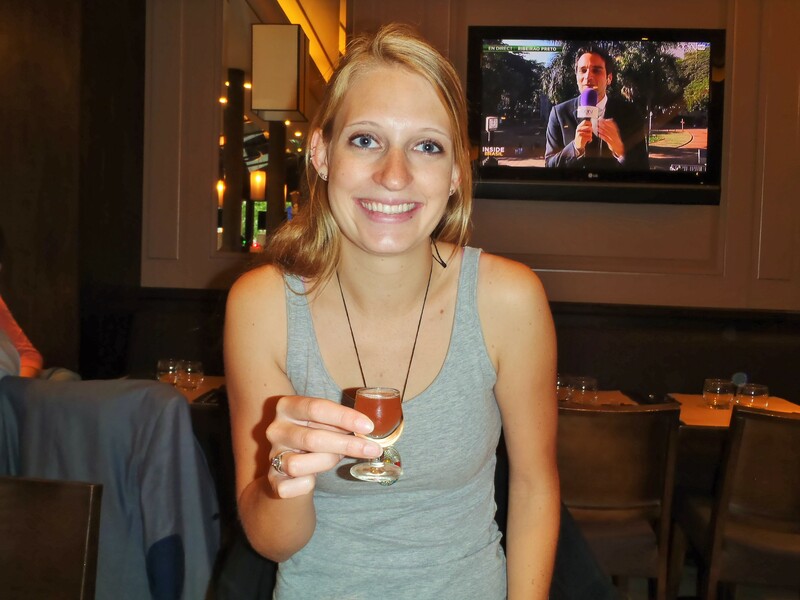 We headed to the Bastille district, an area one of Amy’s friends had recommended as sagood place with lots of bars and restaurants. She was right. We ended up at a Thai restaurant, where we split a bottle of wine and got some delicious Thai food. By the time we left dinner, it was pretty late and the whole area was hopping. All the bars were lively and people were all over the place partying and being merry. 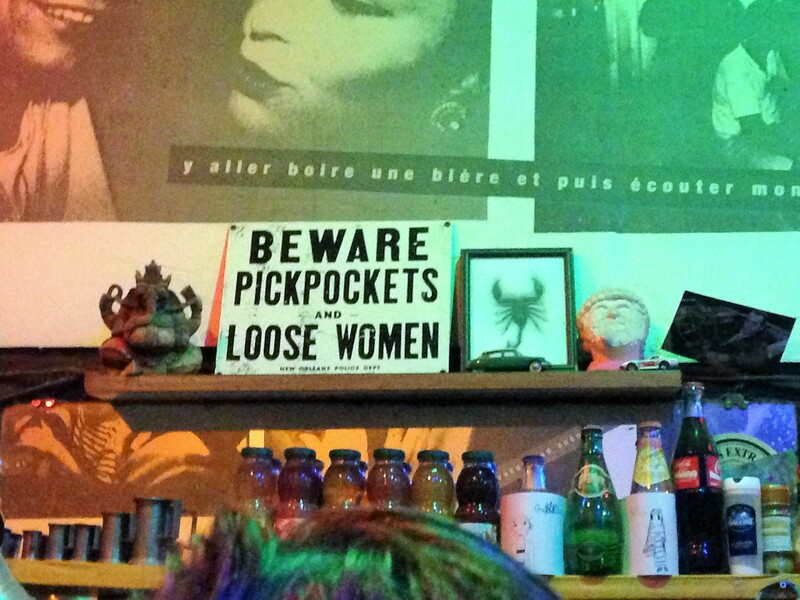 Sign in one of the bars we went in…interesting? 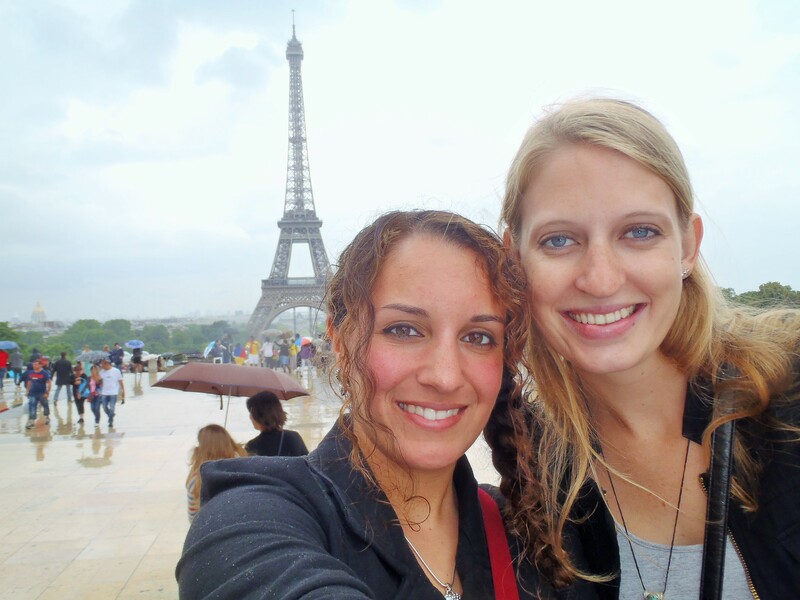 We didn’t sleep in too late the next morning, and headed out to explore Paris before 10am. 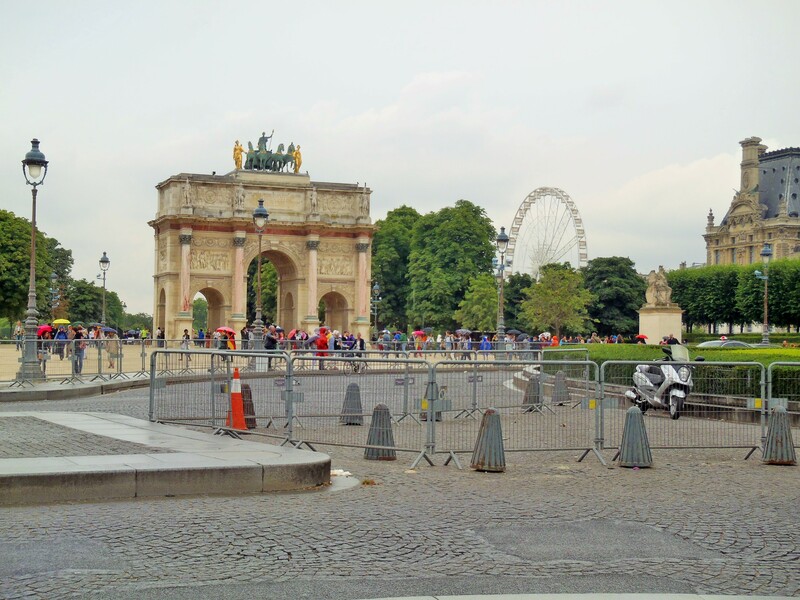 I had a game plan all mapped, out, and the first stop was to take the metro to the Saint-Germain-des-Prés station where we could easily walked to the Love Lock Bridge. 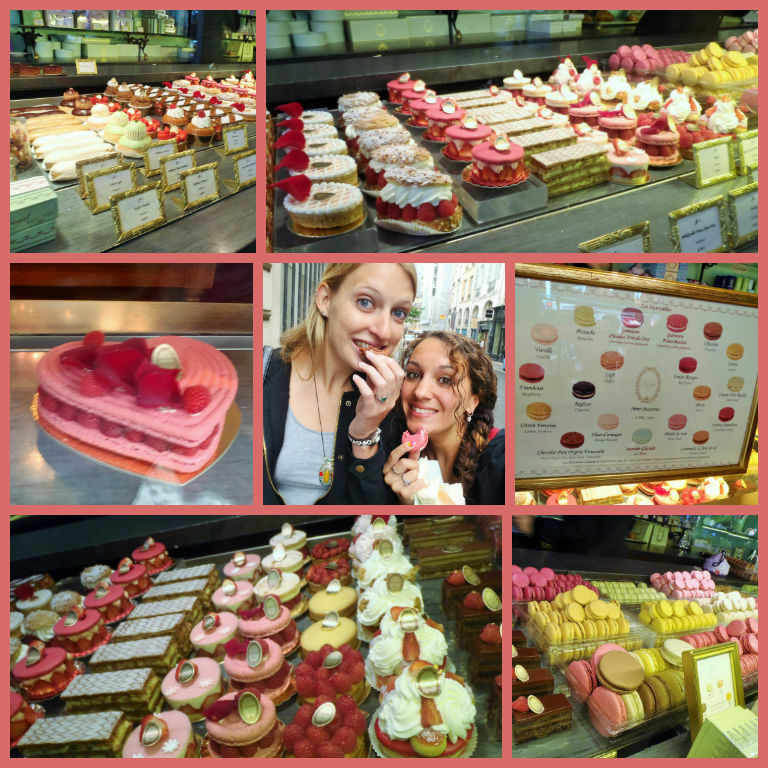 We started off the day on the right foot: we passed a macaron shop all my French friends had told me about (La Duree). So, of course, we went in and got ourselves some macarons. It’s never too early for macarons, right? This time, I got a Venezuelan Chocolate one, which was chocolate bliss, and a pink strawberry one with a kind of spongy marshmallowy filling (called guimauve) that I really loved! 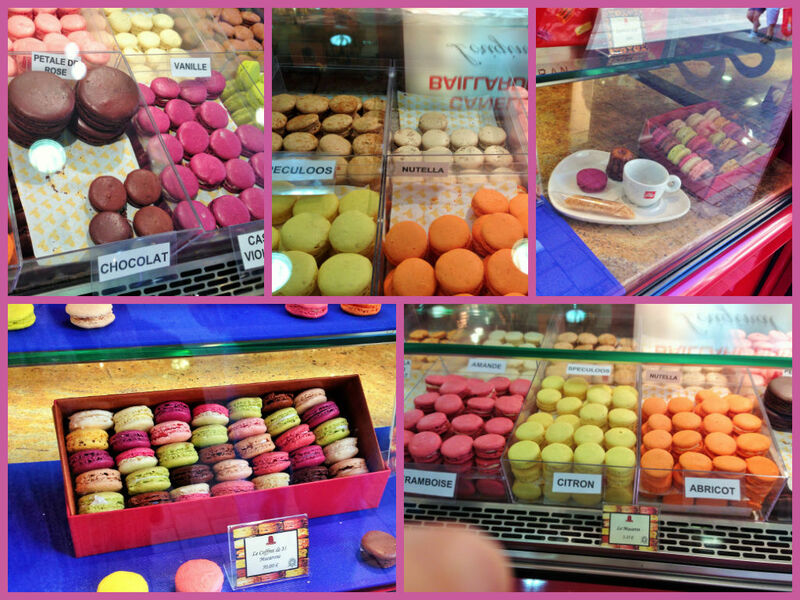 The variety of macarons and desserts in general was overwhelming and awesome! I wanted them all!!! 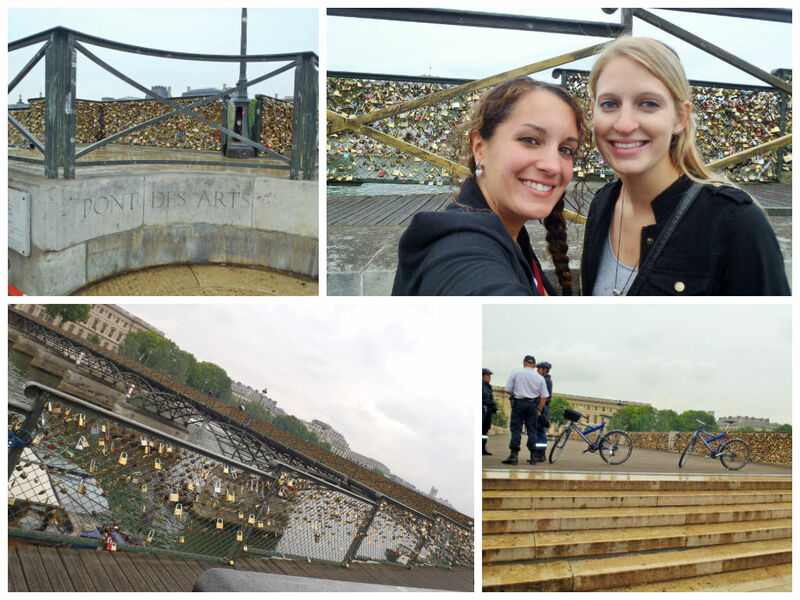 From there, we walked to Pont des Arts, more affectionately known as the Love Lock Bridge. This is the bridge where lovers go and lock a lock to the bridge railings, then throw the key in the Seine river as a romantic gesture representing their commitment to their love (*how romantic*). There are so many locks that part of the railing collapsed just days before I arrived! When we went to the bridge it was not open for walking across. We thought that it was closed because of the recent partial collapse, but it was still cool and we could see all the locks and took pictures. We then had to walk down to the next bridge to cross the Seine. But, when we got to this bridge, I look down to the Pont des Arts, and see people walking across! I guess we just picked the wrong moment to want to cross it! Oh well! The river Seine looking down at the Pont des Arts, which suddenly has people walking across it! 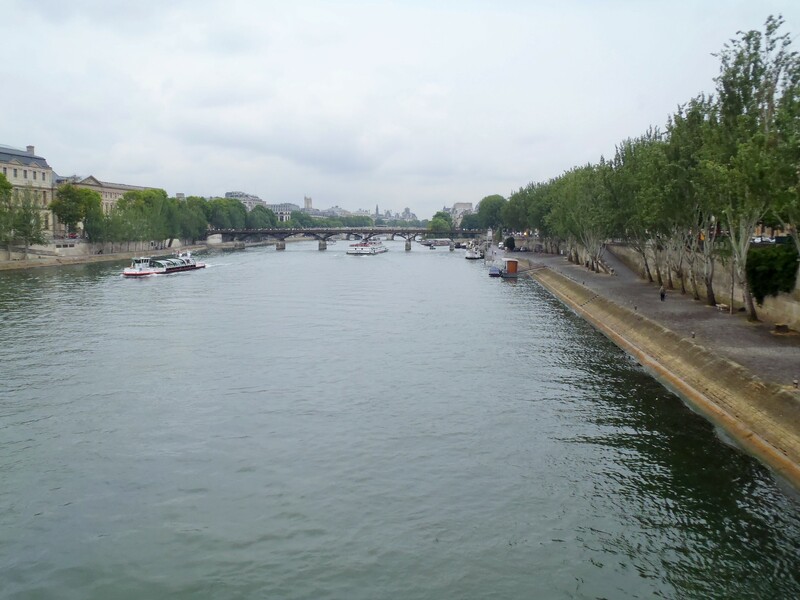 Once we crossed the river, we headed to the Lourve. We decided we didn’t want to go in, since time was not something we had a lot of. I did take pictures in front of it though. 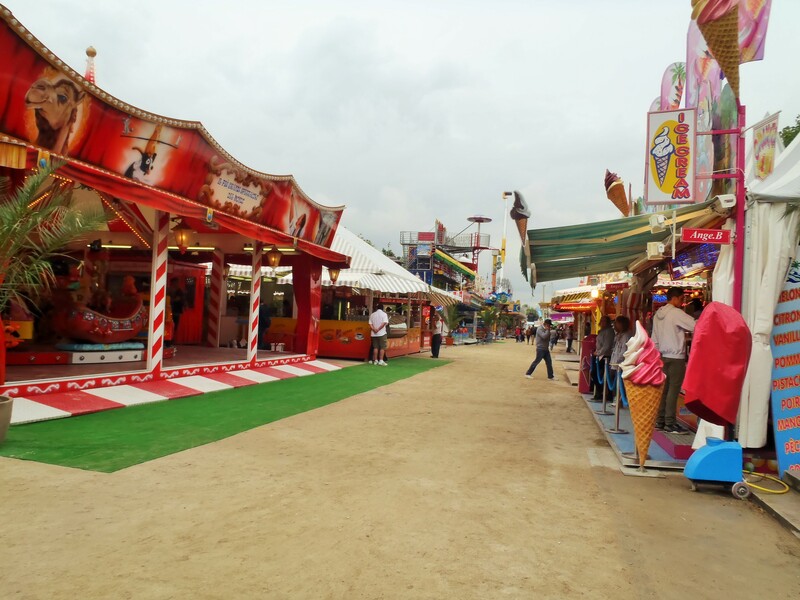 From here, we walked through the gardens in front of the Lourve, and then took a detour which led us through a mini carnival, complete with Ferris wheel, that bordered the gardens. 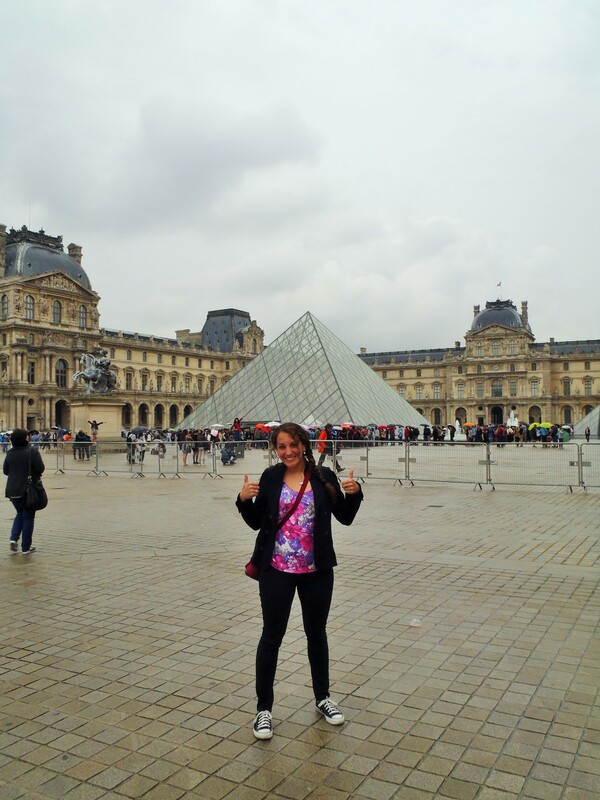 In front of the Lourve. That is NOT the Arc de Triomphe. Mini carnival next to the Lourve. 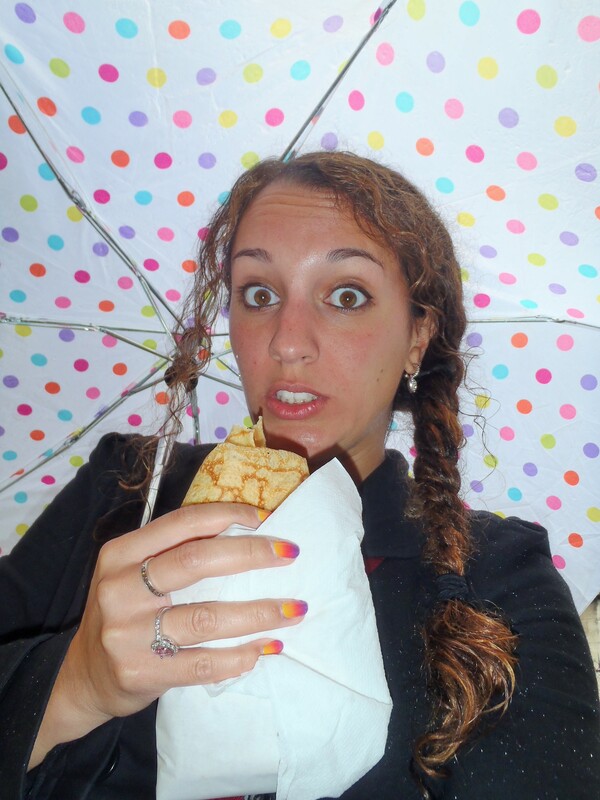 Death by chocolate (crepe) – Before and After. 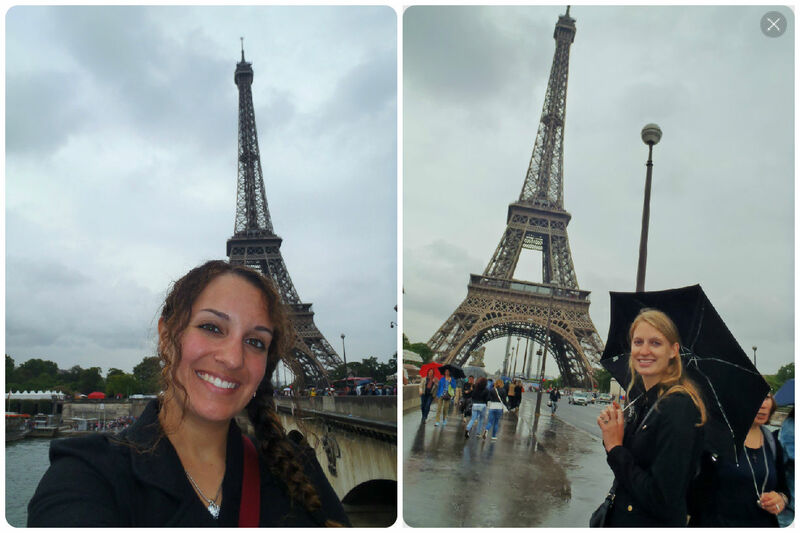 After this, we headed back towards the Champs-Élysées and the Arc de Triomphe. 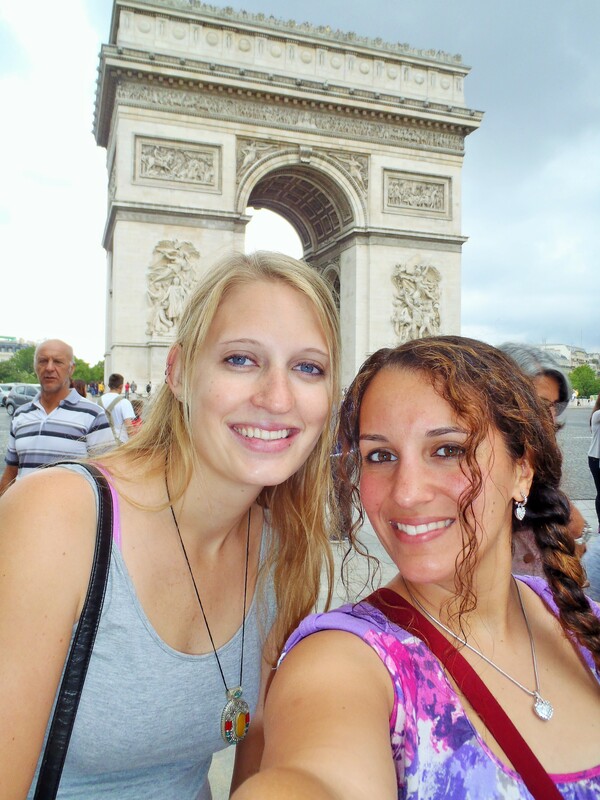 We walked the entire main length of the Champs-Élysées, from the obelisk to the Arc de Triomphe. 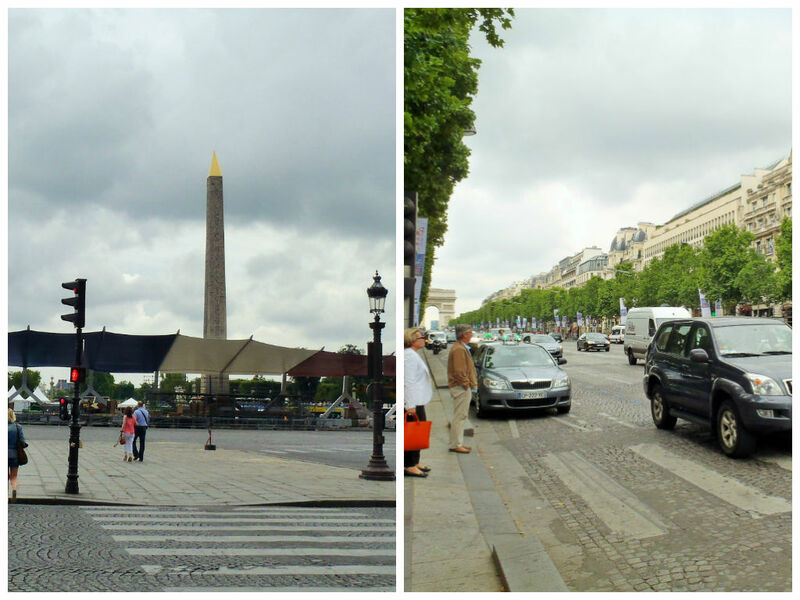 The Obelisk and the Champs-Elysees. Where are Johnny and Orlando?!?! We finally reached the Arc de Triomphe. I didn’t remember that people could go up to the top, but sure enough, there were lots of little heads popping over the roof of the arch. 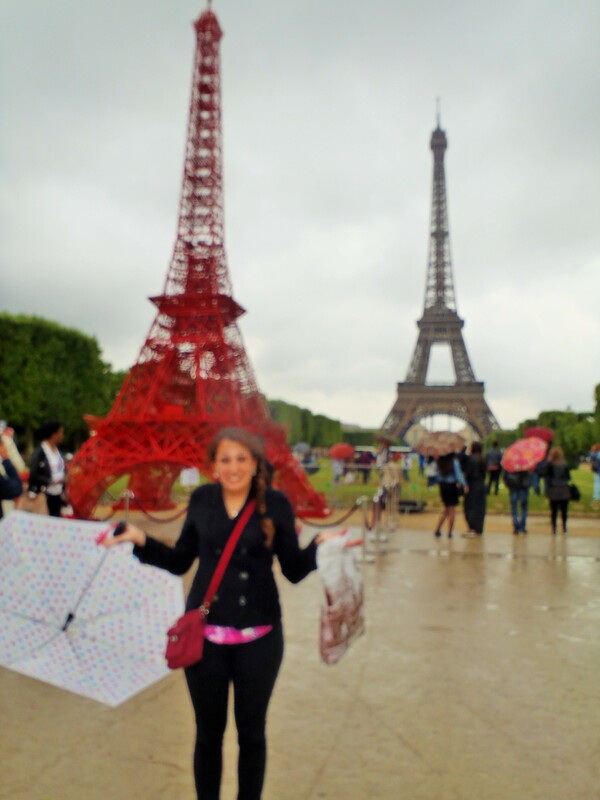 Our next destination was the Eiffel Tower. 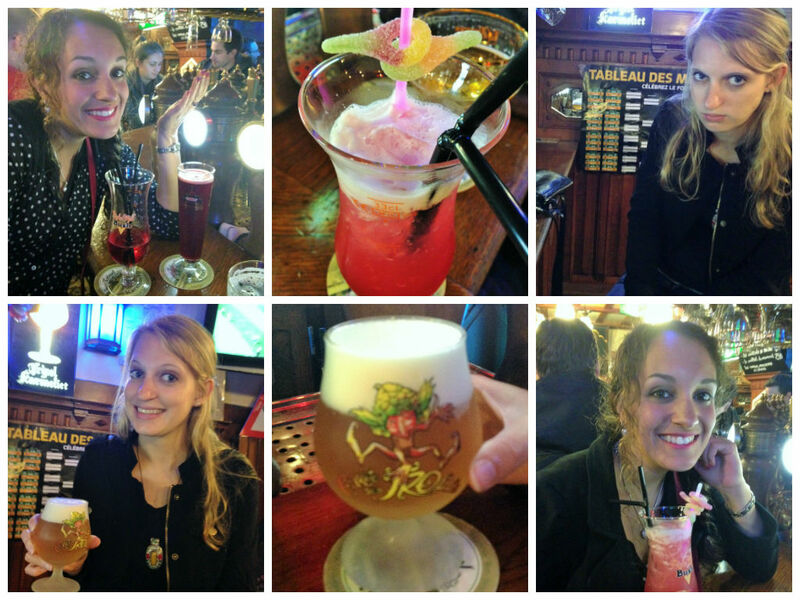 On the way, we stopped at some souvenir shops so I could buy some awesome Paris souvenirs, and then for lunch at this café/pub called Pub Kléber. 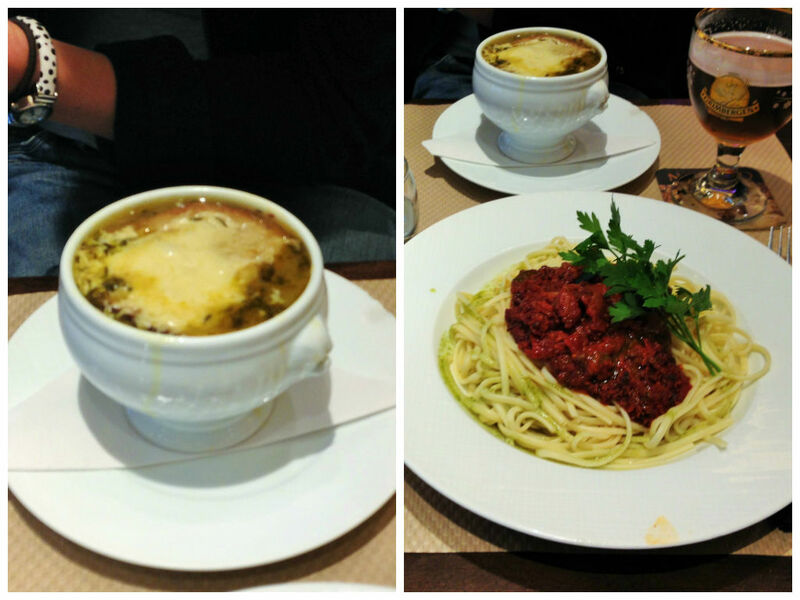 I got spaghetti, because that is what I was craving, and Amy got French onion soup, because we were in France. Duh. It was all delicious, as were our drinks (I got wine and Amy got beer). We’d worked up quite an appetite after all, having walked across half of Paris (or so it seemed) by this point. Amy’s little bitty glass of beer to taste. Having refueled, we were well-prepared for the trek to the tower. It didn’t take too terribly long, and, overall, wasn’t half bad. We got a good workout. 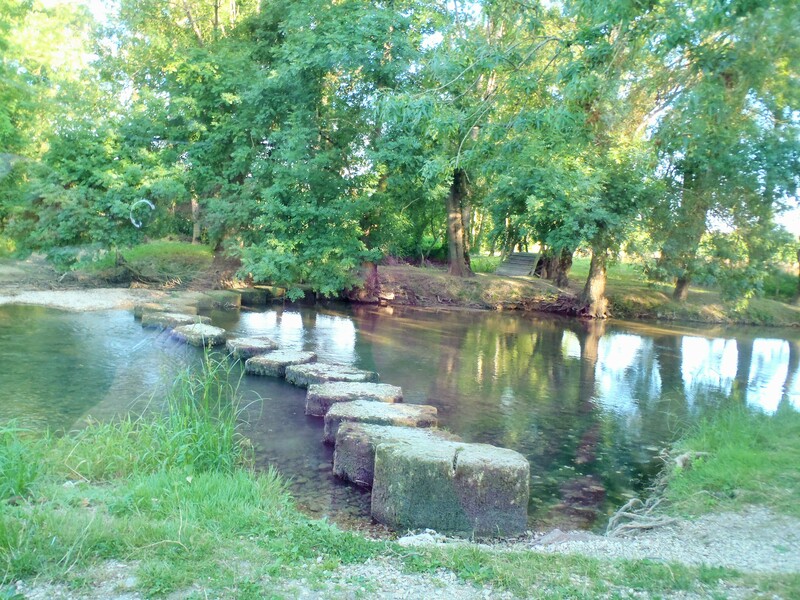 And, considering all the eating and wining I’d been doing since arriving in France, the walking was a good thing. It was also mildly raining off and on all day, but, again, for some reason this did not seem to put a damper in our day at all because the temperature was quite pleasant and it was never raining super hard. 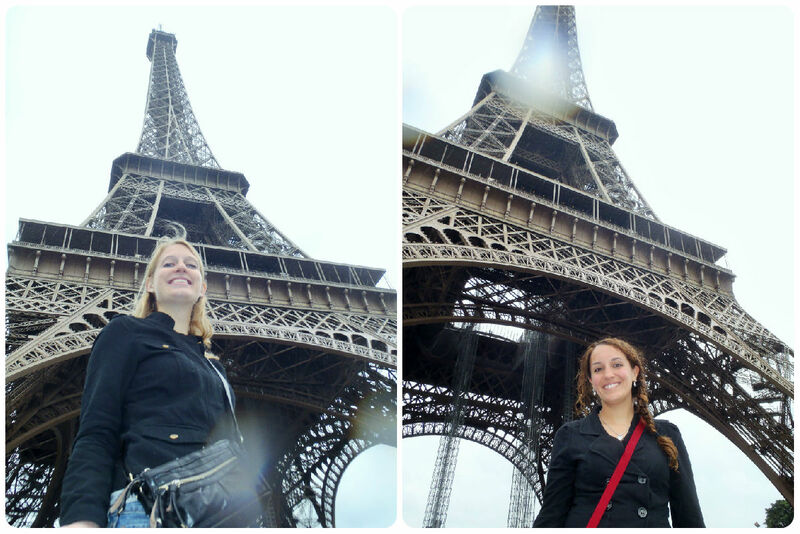 This was good, considering, of course, we wanted lots of pictures in front of the Eiffel Tower. 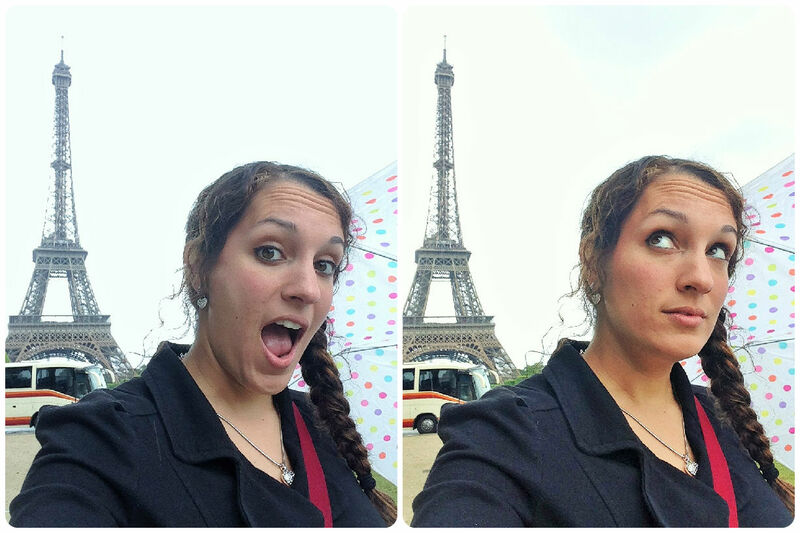 I took many Eiffel Tower selfies, just because you HAVE to. In this day and age, with camera phones and the sudden “selfie” trend, I think it a crime to go all the way to the Eiffel Tower and NOT take an Eiffel Tower selfie. So, just to make up for all the sad souls who failed to take selfies (ehem Amy ehem), I took enough for all of them. We decided not to go up the tower. The lines were long and we didn’t even know if we would get a ticket anyways (do they sell out in a day?). Either way, we marveled at it from below and were satisfied with that. There was still more to see and we had to get a move on! 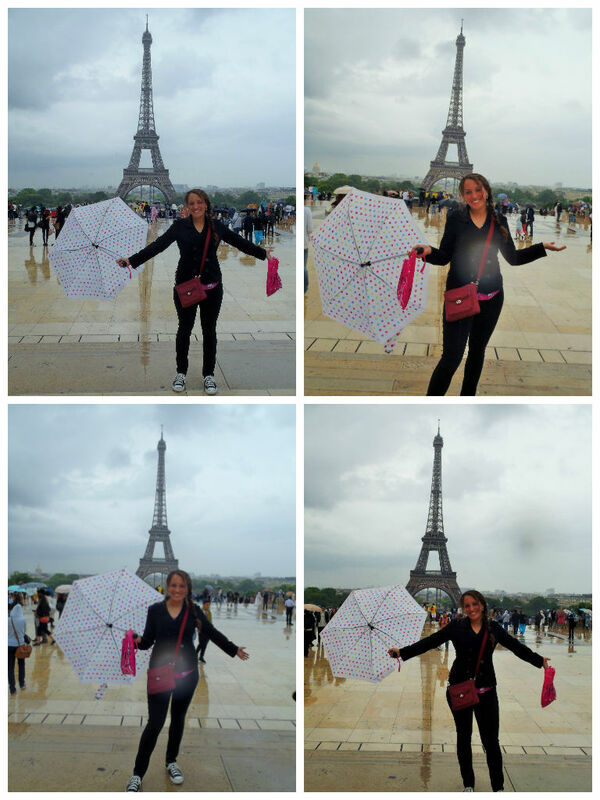 From the Eiffel Tower, we walked to Les Invalides. 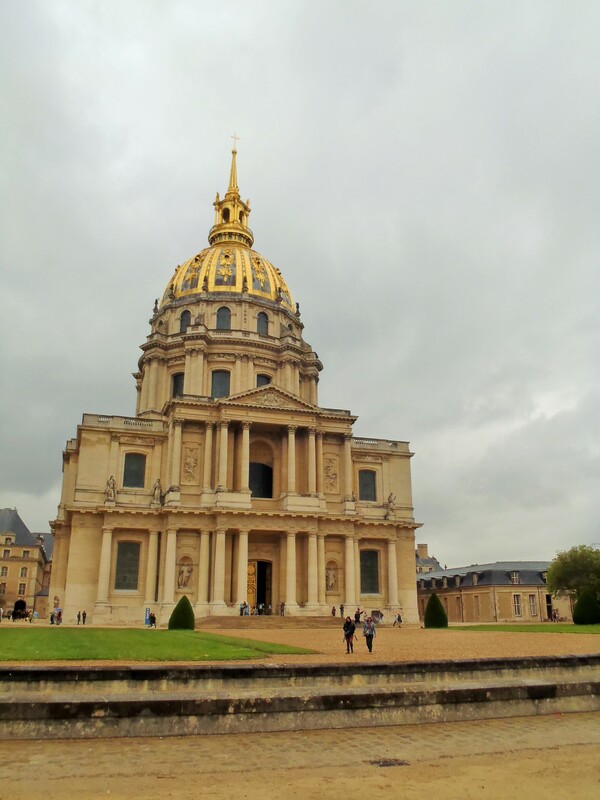 Amy tried to sneak in to see Napolean Bonaparte’s tomb, but alas, the guard turned her away without a ticket. Oh well! 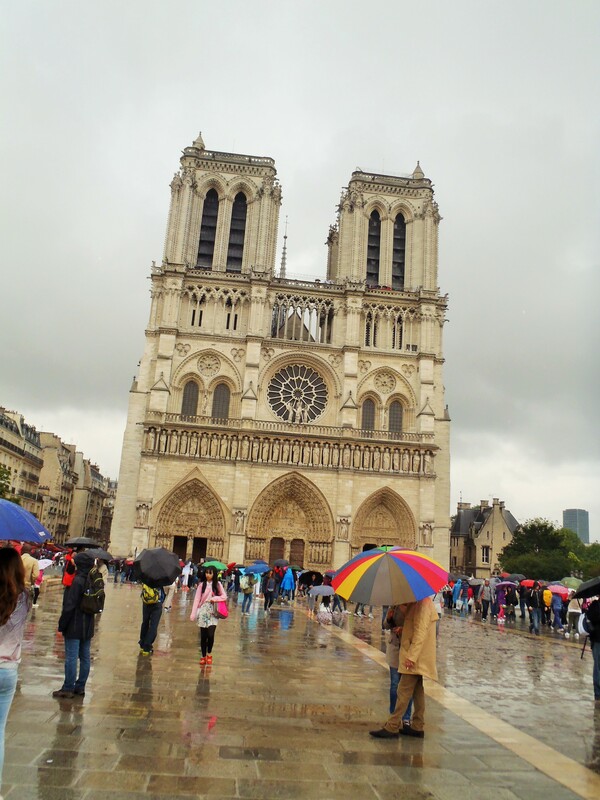 After Les Invalides, I finally convinced Amy to let us hop on the train and take THAT to Notre Dame (that would have been a loooong walk!). 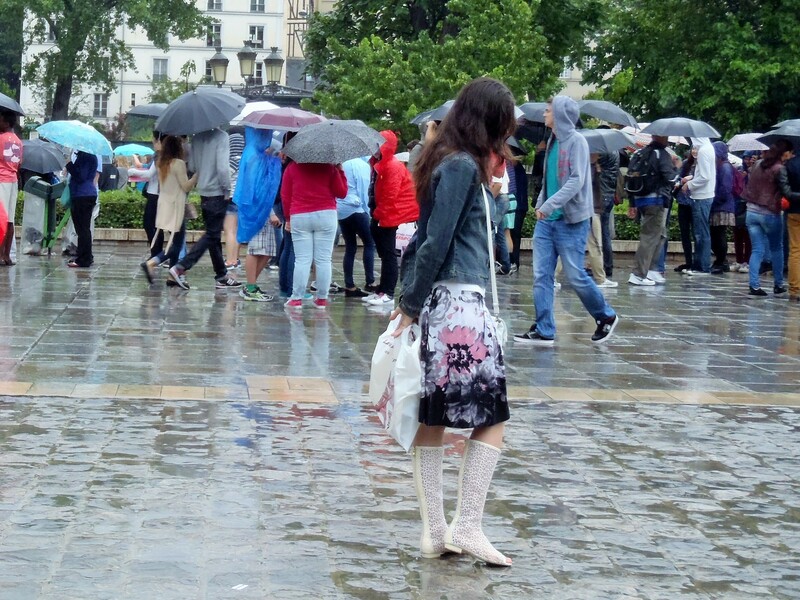 We took a look at some gargoyles, and I was truly shocked when I saw tourist wearing peep-toe rain boots. For reals. I’m not sure if you can tell from my sneaky creeper picture, but it was one of the most ridiculous shoe choices I have ever encountered. Peep toe rainboots…Are you for real right now? We also got a second round of crepes, because our time in France was coming dangerously close to an end and I had not had my fill yet (will I ever!?!?). This one was straight up Nutella and spot on for me. One of the most prominent memories of my last trip to Notre Dame in 2006 was getting a crepe right next to the cathedral, so, I figured I’d keep the tradition alive. I also did some more souvenir shopping here as well! By this point, it was late in the afternoon, and we decided to go back to the hotel to relax for a few before going out for the evening. Amy then had the brilliant idea to stop at a store and get cheese and wine and crackers/ So we did. Glorious decision. 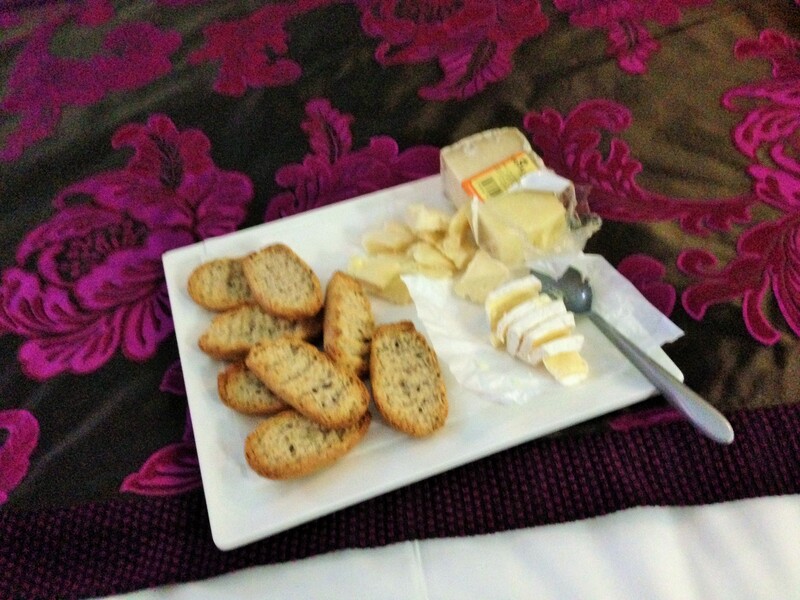 French wine and cheese! Aren’t we adorable?!?! 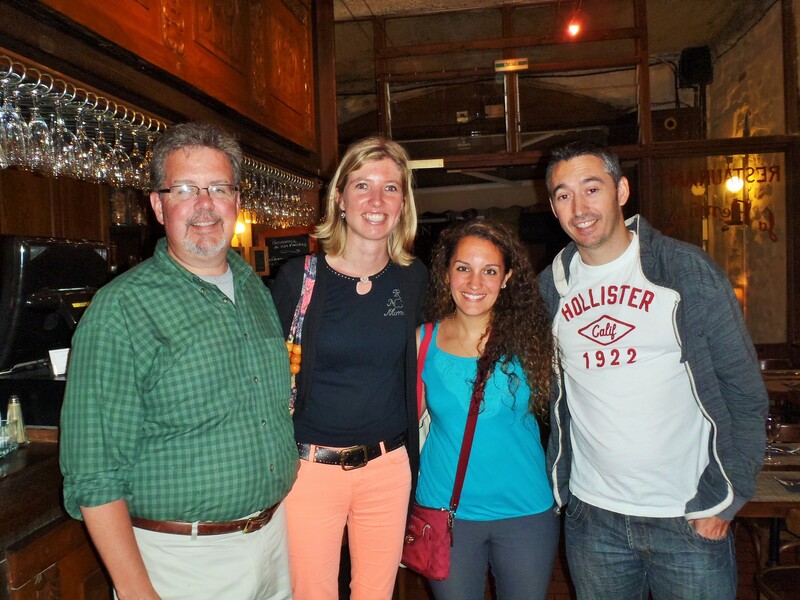 This was the one time in Paris between our check in and check out that we saw my coworker Jim. He joined us for our snack for a little, while we also watched some of the Brazil vs. Chile soccer match. We then got ready and found a bar where we could watch the Colombia vs. Uruguay match (gotta support the team of my man!). I’m not sure if our plan was to bar hop from here, or to just chill there the whole night, or if we had a plan at all. All I know is, we ended up staying there the whole night. Wine to beer to mixed drinks to shots. It was a good night with Amy in Paris. The next morning, Amy left for her train before I did, and shortly later, I packed up, hopped in a cab with Jim, and headed to the airport. After getting a little confused at the airport, we eventually made it to our gate, and then said au revior Paris! It was a bittersweet goodbye if I’ve ever known one! 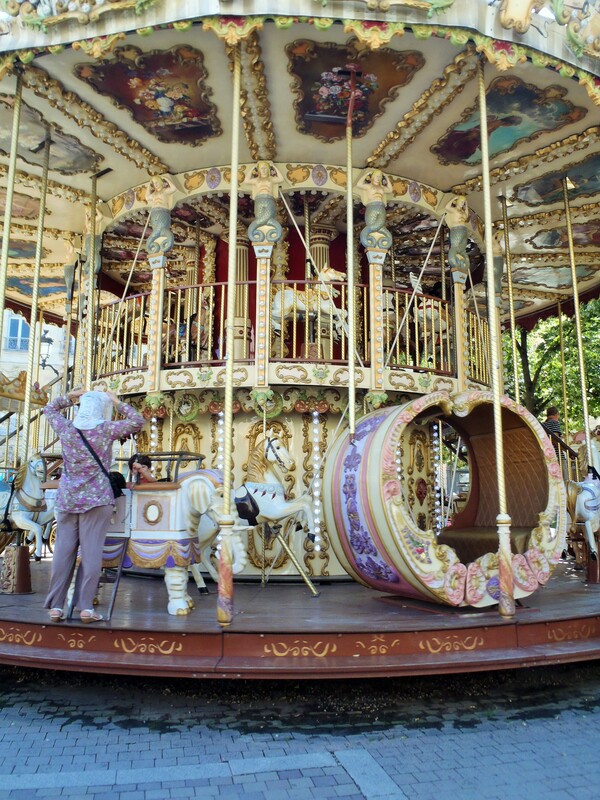 « Countdown to France – 6 Days! 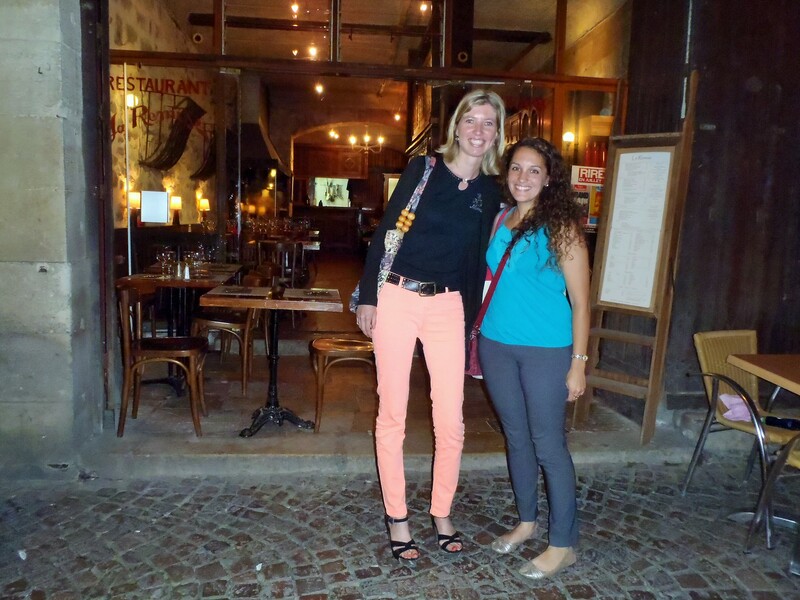 Can you get along in bordeaux with just speaking english? You definitely can! It’s helpful to speak some French, or at least know things like menu items and such (or have a cheat sheet or Google translate), because all the menus were only in French. But, most people speak at least a little English and we managed just fine speaking only English! Oh la la!! SO happy for you – a wish come true!! Life has given you such a wonderful experience to live, learn and laugh! Me alegro mucho por ti!